Vespers was one of many poems composed by William Stafford, who served for many years as the poet laureate of Oregon. As I pondered over this poem it seemed to me that it foretold the ending of the life cycle for all of us. And so it was fitting to enter this piece in a traveling exhibit in Oregon that commemorates the 100th anniversary of the birth of William Stafford. It seemed appropriate to me that so somber a piece should be lettered on black paper and so I used Arches 140# black, cotton rag paper to tell this story. Somber though it may be, for many of us the end of life is a cherished new beginning, and so the use of 23K gold leaf with intricate filigree to brighten the darkness. 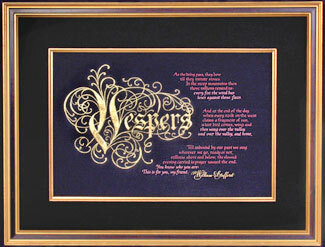 The pinkish toned lettering (using Windsor Newton gouache) of the poem itself, depicts the setting sun (vespers) as portrayed in the poem. Lettering on black paper, as you might imagine, is quite difficult because you cannot easily see the pencil markings. However, by using a very soft lead pencil and by shining the light on the drawing board at quite an angle, the lead pencil markings were discernible, making the lettering doable. The traveling exhibit, which has upwards of 50 calligraphed poems by William Stafford, will be at the Collins Gallery on the top floor of the Multnomah County Library, Portland, Oregon from September 29 through November 9th. It will then travel to the library in Salem, Oregon’s state capital, until the end of the year.